Here are some HAWLs from the past 2-3 weeks, also the time which I went completely AWOL on here. My activity here on LaLD may have stopped, but the HAWLin’ definitely hasn’t. As you can see, I’ve obtained more Premieres and World Classes. Not one, not two, but three Mercedes 500SL’s. 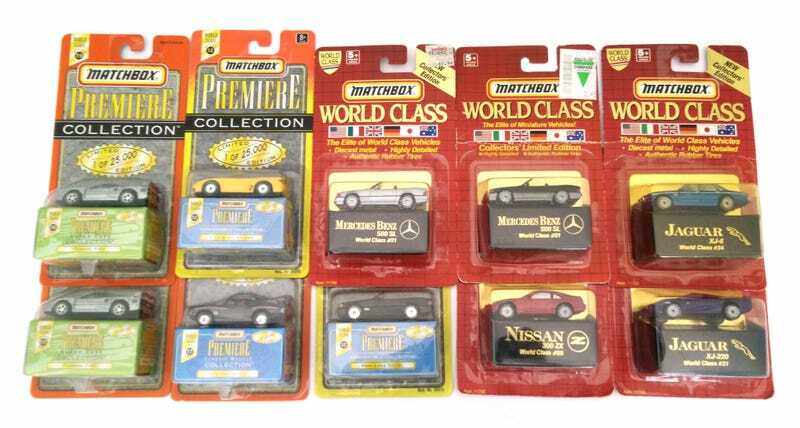 I think I have all the variants for that casting now, besides the Matchbox Gold version that Philipilihp teased me with (which I’m gonna have to get at some point). As you can also see, I’ve got two silver F40's above. They came as a pair for about $12 shipped and that was a good price for one, let alone two. The extra will be up for trade. As a reminder, I’ve been able to stick with my budget of under $5 per car (on average), and these are what I could call the “desirable” models too, not the American muscle stuff that goes for cheap. Just wanted to let you guys know that if you want to collect these, don’t fall for the ones that are priced at $10-15. Once again, more Premieres. A couple of these are extras, the black 600SEL and the purple Diablo, so those are for trade too. The main reason I got this lot (and it was around $20 shipped) was for the silver RX-7 and the black Mitsu Spyder. FYI, Select Class is a Walmart Exclusive, I believe. OK, on to some more recent product. Some goods from Mattel. The much-talked-about Jeep series is five steps above last year’s. I don’t think I saw the 4x4 Willys, but I’m glad to have these three, especially that orange Grand Cherokee. The blue RX-7 is a K-mart exclusive which I missed because I was overseas at the time. It must have been a return, because I found it at Walmart in a dump bin. Someone’s been returning old releases recently, and I saw a bunch of white 240Z’s amongst other things. Couple of Auto World recolors. No explanation needed on why I had to get these. A pink ‘66 Charger that I passed on almost a year ago. By some miracle, my local Walmart restocked with this wave (again, it came out almost a year ago), and I grabbed it as fast as I could. Lastly, the oddball. I told myself not to collect any more of these Maisto’s (or Jada’s), but where else can you find a STS-V? I might have to attempt a tampo delete on these, but they look great nonetheless. That’s it folks, thanks for looking, and good luck with your hunt!